The whole expression of proteins is based on the DNA coded in the genetic triplet code. Therefore, this code is essential for all living organisms. The expansion of the genetic code, by adding new bases to the DNA, offers multiple possibilities, like the in vivo integration of ncAA in proteins in vivo. At the same time, new challenges arise constantly. 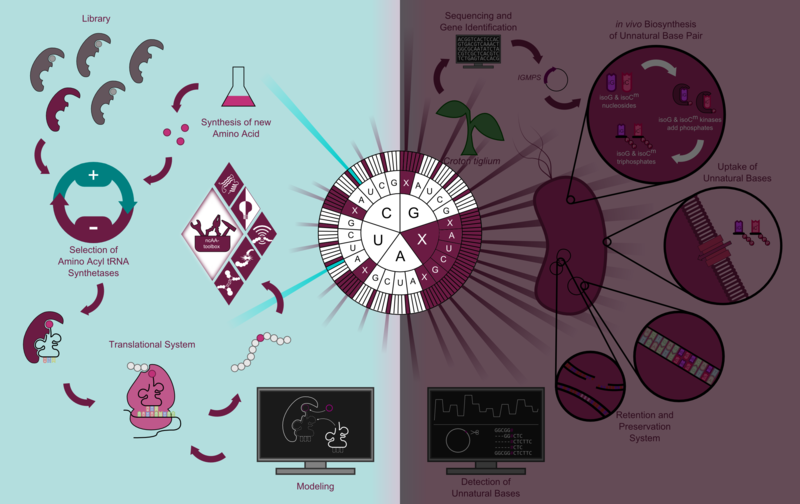 Besides ensuring correct replication and preservation of the unnatural-base pairs (UBP) , the whole transcriptional and translational system has to be adapted if a non-canonical amino acid (ncAA) is coded by UBPs. The incorporation of ncAA generates many new properties of proteins and also a wide specter of applications. It can be achieved either by the use of UBPs or coded by an amber-stop codon.